Colemans Solicitors LLP, one of Maidenhead’s most established and prestigious law firms recently sponsored one of the key award categories at this year’s prestigious Maidenhead and Windor Business Awards. Local businesses battled it out hoping to win one of the 13 awards during the evening, with the Excellence in Customer Service award which was sponsored by Colemans, being one of the most sought-after awards. Colemans sponsored this award as excellence in customer care is at the heart of what the firm themselves are about, and they wanted to sponsor an award that would showcase and reward another business who clearly demonstrated that they went above and beyond in terms of their customer care. 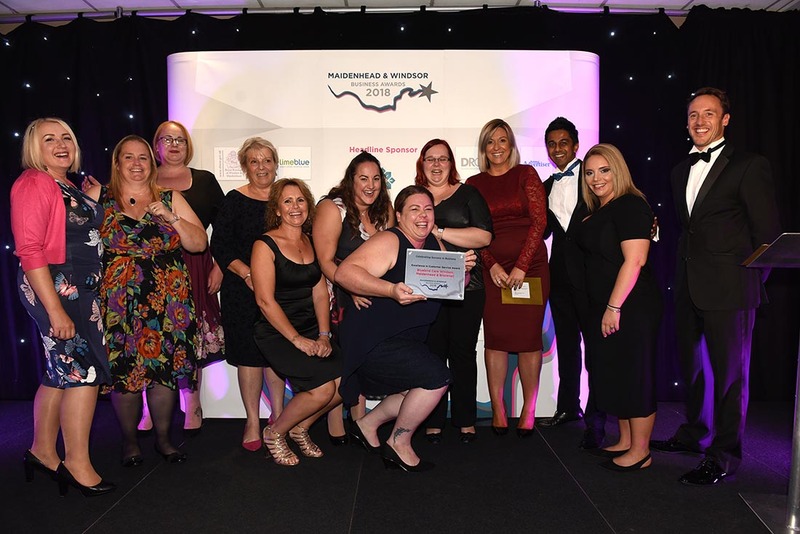 The firm felt that the winner of this award had to put excellence in customer care at the forefront and although the standards of entries were very high, Bluebird Care – Windsor, Maidenhead and Bracknell won. Kate Williams, Managing Partner said, ‘Bluebird Care clearly stood out amongst many great businesses as truly deserved winners of this award’. Kate (in red) presented a delighted Bluebird Care team with the 2018 Excellent in Customer Service Award.